Thirteen people were arrested during "Day Without a Woman" demonstrations at Columbus Circle Wednesday afternoon, police say. Ida Siegal reports. Rallies and a march were held across Manhattan Wednesday as women across the nation skipped work for "Day Without a Woman"
Thousands showed up to march and demonstrate at "Day Without a Woman" gatherings across the city Wednesday, part of a nationwide one-day strike to show women's impact on the American economy. The first demonstration of the day saw about 1,000 people gathered on Fifth Avenue in the shadow of Trump Tower to demonstrate on International Women's Day. Women dressed in red brandished picket signs throughout the crowd, some with feminist icons like Rosie the Riveter accompanied by messages like "You can't do it without us" and others with the female gender symbol. Some men joined the rally as well. Thirteen people were arrested at the Columbus Day protests, including Palestinian-American activist Linda Sarsour and fellow Women's March organizer Tamika Mallory. All were issued desk tickets for disorderly conduct and released. Later in the evening, hundreds of people, including several parents and children, began to march from Washington Square Park to Zuccotti Park. Rallies and a march were held across Manhattan Wednesday as women across the nation skipped work for "Day Without a Woman". "We all kind of banded together as a day to celebrate women and enlighten people to the fact that women of all minorities are not equal yet," said Alexis Hewitt. Business owner Lauren Avend said, "We employ a lot of women, we have a lot of friends who are mothers, and we think that women should have a lot more of a voice." Thousands across the country have signaled their support and interest online and to employers. Organizers are encouraging women to wear red in solidarity and to spend money only at small women- and minority-owned businesses Wednesday. For some, participating in the rallies is a way to uplift marginalized communities and facilitate much-needed social change. "I'm here because I've always been a feminist, to be a champion for more marginalized communities, and to do more for our whole country in the face of a big threat," Queens resident Domenique Osborne said as she held an anti-Trump sign at the Columbus Circle protest. 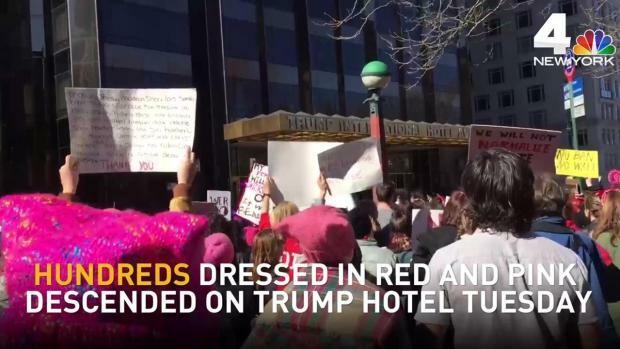 Others said demonstrating is essential because, almost two months into President Trump's term, they are concerned about women's rights hanging in the balance. "I'm here as a demonstration of solidarity. Equal rights for all is just a fundamental truth," said Washington Heights resident Gilbert Smith. "We still have such a long way to go to recognize that and make it a reality." "We just wanted to keep the momentum going since the woman's march in reaction to Trump's election," said demonstrator Lindsey Montague. "We just have a lot of concerns about the administration's agenda." The New York City Council Women's Caucus met on the steps of City Hall at noon to eat brown-bag lunches and discuss women's issues like health care, education, child care and sexual violence. Many of the women demonstrating stayed home from work or left work early as part of the strike. But staying home from work was challenging for some, and others participated creatively. Michaela Balderston said at Zuccotti Park, "I don't consider myself on strike. I think you can kind of do or make it what you want. For me, that was going to work, and we ordered lunch from a woman-owned business and then came out at 4 to the rally, and we're walking now." Restaurants throughout the city are demonstrating in their own ways. One restaurant owner, the Wren's Mark Gibson, asked male employees to cover shifts for female colleagues who planned to strike and wear red in support. Another restaurateur said she would donate proceeds from her eatery's sales of a signature cocktail and appetizer to Kirsten Gillibrand's Off the Sidelines, a nonprofit that helps women run for office. "A Day Without a Woman" is the first national action by organizers since the nationwide marches held the day after President Donald Trump's inauguration. They drew millions of women onto the streets to protest misogyny, inequality and oppression. The Women's March on Washington alone drew as many as a half a million people from across the country on Jan. 21. A simultaneous march in New York City drew 400,000 people.